I've decided I have penguin feet! Here's my drop back from yesterday, I was quite proud of it, first time dropping back without lifting the heels with the feet straight. ...it's just that I have Penguin feet. Heels down but they look turned out right? So is it that I have penguin feet or do people turn their feet IN, have the outside of the foot straight rather than the inside, a whole different ball game no? Either way it feels like an improvement, can't seem to come up yet with my heels grounded and it's not as gentle a touchdown but I guess that will come as I get used to the new shift in balance. Another one of those things that I'd come to think impossible, thought about nailing my feet to the floor once, or at least a pair of shoes. I think it's to do with tucking my tailbone in before pushing the hips forward and stretching out of the pelvis, something I picked up from Heather Morton's Back bending DVD this week. 'In 2000, Heather trained under Ashtanga Guru, Shri K. Pattabhi Jois in Mysore. She had the privilege of learning the primary series of Ashtanga directly from him. During this same year she met Yogacharya V. Venkatesha, the founder of AtmaVikasa Yoga and a champion in backbending. Yogacharya became her primary teacher and from 2000 to the present she has been personally trained under Yogacharya'. I heard about Venkatesh, the 'Mysore back bending guy', through Boodiba who spent some time with him, she made some excellent videos of his approach (more of these can be found by clicking on the video and going to her Youtube channel). Heather's video is a kind of backbending routine DVD, she has a sun salutation that has more backbends than the one we're used to in Ashtanga or Vinyasa Krama. Next she moves on to some standing arches and counter poses, some Bow postures, same kind of thing as Ramaswami's Bow sequence and some table and wheel postures, again similar to what I'm posting this week on Ramaswami's Supine subroutines. So it's familiar stuff but Heather's talking you through these postures, giving you little hints and reminders and really bringing out the best of your back bending, she has some long stays that are really challenging. If your struggling with back bending at the moment then this might be for you an extra evening practice, go through it a few times and them bring some of here suggestions to the backbends in your regular Ashtanga practice. She also has an Advanced back bending DVD that I picked up at the same time but haven't had the chance to practice with as yet, here's a preview. Best of all, both these DVD's can be paid for using Paypal and downloaded, took about ten minutes on my connection. If you buy the download version you'll get two emails the first will be a welcome and give you login details, password etc. the second mail will be an order confirmation with a link to put your password in and start the download. Oh for Mac you might need a converter as it downloads into .rar files you can pick up a free converter here http://www.unrarx.com/ I used it and it worked fine. Still a way to go to touch my head but it's happened in raja kapotasana and gandha B. so why not here. Thanks. That dvd looks really interesting. I had a little scout around for Venkatesh media about 3 years ago, but there was little or nothing back then. Straight feet? I wonder if a straight foot is straight by the instep, outer side or straight down the middle. After all, they are kind of wedge shaped aren't they. I guess as long as there's no Chaplin-strut involved, all is well. Hi, funny that you 'decided' you have penguin feet. I watched Heather's BackBending dvd over the weekend with full attention, she does hang in there for long periods of time... interesting your association with one of the VK subs. One thing that was a bit disconcerting to me was how she kept her feet together on the hanging backs... Does Ramaswami do that too? The Venkatesh stuff is interesting but hard work, long long hang backs, the will needs to be strong. My backbends tend to be pretty good nothing stella but not bad but the reminder to tuck my tailbone in made a big difference yesterday and this morning, love all those little elements that fit into practice over time, they all add up. I figure straight feet are straight feet, how you stand naturally. I used to really turn them out as I went back and wanted to stop that, switched to keeping the feet from turning but lifting the heel instead. Now the feet are staying where I start from, a line parallel to the edge of the mat running through the heel and big toe, without the heel lifting so happy with that. Of course you'll never get a roomful of yogi's to agree on this or probably anything else. Nice thing from Jack Kornfield I heard recently about a Buddhist conference. Thai, Chinese, Japanese... American, from all over, all had completely different ideas of what Buddhist practice was. the conference was just to listen to eachother, thought the yogi's could do with that. Hi Claudia, on my lunchbreak in the library catching up on some blogs I never get to read these days. Yes i noticed the feet together, in theory I think Ramaswami does have them together, dropping back, kapo...I did a post on it once, managed it but very unstable. I don't think Heather had her feet together when she actually dropped back though, will check. "Tuck the tailbone in", my mantra for the week. Any chance you could post a link to that dvd download site? 'Tucking the tailbone in' sounds a lot like 'Mula Bandha'. Well, it seems very difficult to tuck the tailbone in without engaging mula bandha anyway. Awesome in Utpluttihi (sp?). yes, you are right, she did NOT have them together on the drop backs, just on the hanging in. Sorry Steve, forgot to mention here that I've added links to the download in the post, i think you click buy and then it takes you to the version you want. have added a note about how it turns up in your inbox and how to convert it if you have a Mac. Hey Grim, do you have any tips for headstand? 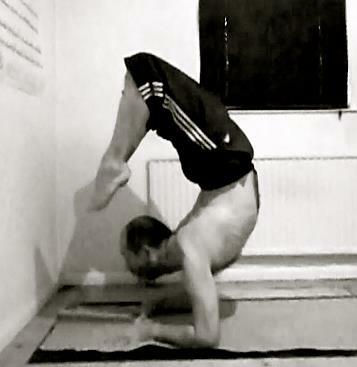 Samakonasana Watch ( Day 9 eve. ) Touchdown! 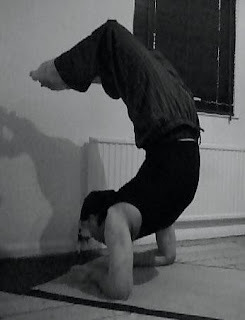 Raja Kapotasana first toes to head.